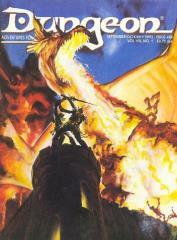 #43 "4 AD&D & 1 Dragonlance Adventure"
It's alive, it's hungry, it's growing. And you're on its menu. An AD&D adventure for one character of level 2–4. Moving to a new place is always a chore. Now it's deadly. An AD&D adventure for character levels 3–5. Get ready for a dazzling finale—yours. An AD&D Dragonlance adventure for character levels 4–7. Could your mission be a snow job? An AD&D adventure for character levels 1–4. Never, ever steal a silver sword. An AD&D Forgotten Realms adventure for character levels 8–12.